USB-C to USB-C Cable with Retainers. 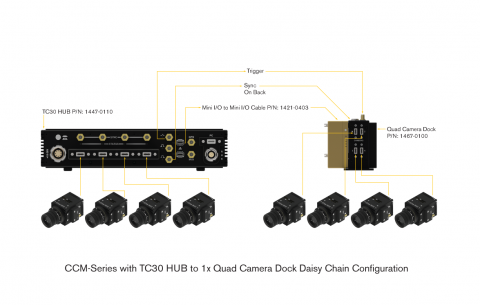 Connects CrashCam mini to a Single Camera Dock 1450-0100, Quad Camera Dock 1467-0100 or TC30 HUB 1447-0110. Standard: -1 (5m); Optional: -2 (3m), -3 (2m) -5 (0.5m) or -6 (0.3m). 3Wh Battery Back-up for OS, OSA, CC series cameras, Single Camera Dock 1450-0100 and Quad Camera Dock 1467-0100. *Battery duration based on number of cameras and functions being used simultaneously. 3Wh Swappable Buffer Battery for Single Camera Dock. Allows for quick swapping while camera is still operating off of the OS Backup Battery 1406-0150 providing additional camera run time. *Battery duration based on number of cameras and functions being used simultaneously. 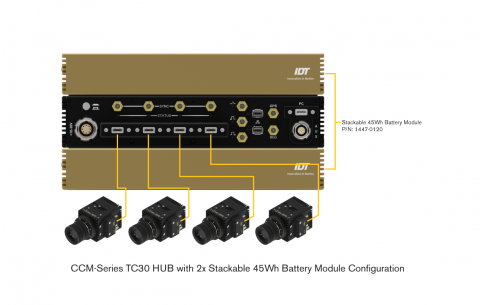 Mini I/O to Mini I/O Cable for TC19 HUB 1447-0100, TC30 HUB 1447-0110, Single Camera Dock 1450-0100 or Quad Camera Dock 1467-0100. 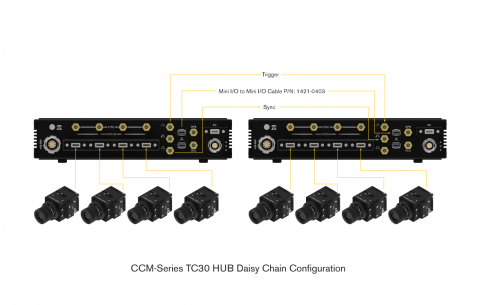 Provides the ability to daisy-chain multiple TC HUB's and/or Single Camera Dock and Quad Camera Dock together. Industrial Mini I/O connector to RJ45 connector, 1m Ethernet cable for TC19 HUB 1447-0100, TC30 HUB 1447-0110, Single Camera Dock 1450-0100 or Quad Camera Dock 1467-0100. Quick Release Mount. 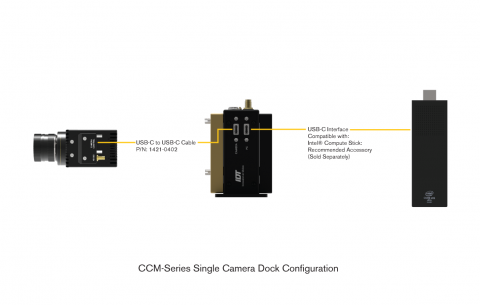 Includes 4x 1/4" mounting holes, 2x release latches one for each Camera Dock (Single Camera Dock or Quad Camera Dock) and release button for Intel Compute Stick Mount 1462-0100. 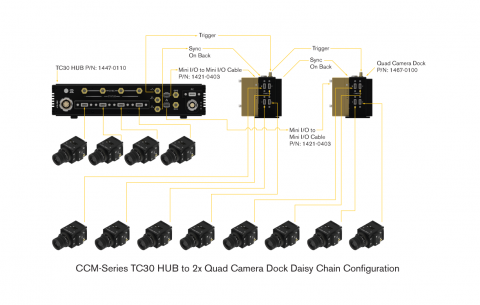 Mount up to two Single Camera Dock's 1450-0100 or one Single Camera Dock 1450-0100 and one Quad Camera Dock 1467-0100. Intel Compute Stick Mount for Quick Release Mount 1462-0100. Includes 2x #10 screws. Mounts a single Intel Compute Stick to the Quick Release Mount 1462-0100. Recommended accessory sold separately: Intel® Core™ m5-6Y57 vPro™ processor. USB-C to USB-C cable. 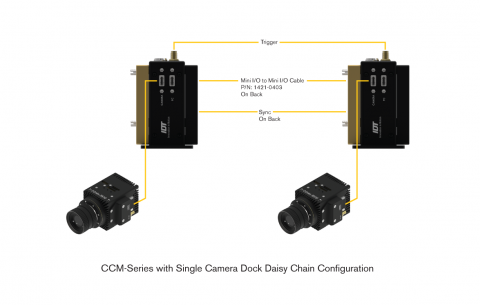 Provides ability to Daisy-Chain two Quad Camera Dock's 1467-0100 together. Quad Camera Dock, USB-C to USB-C 3.0 and Rugged 1G LAN with Mini I/O connector. 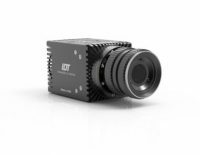 Provides power, communication, synchronization and control for up to four CrashCam mini series camera. Dual battery connector ports for OS Battery Backup 1406-0150 and 12Wh Swappable Buffer Battery 1467-0150 allow for untethered operation. 12Wh Swappable Buffer Battery for Quad Camera Dock. Allows for quick swapping while camera is still operating off of the OS Backup Battery 1406-0150 providing additional camera run time. *Battery duration based on number of cameras and functions being used simultaneously. 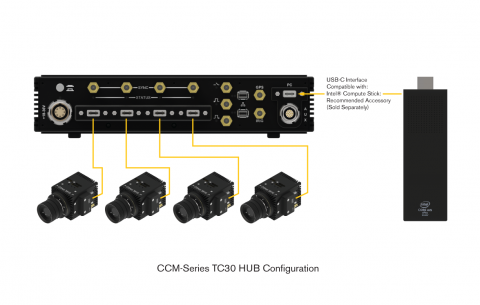 TC30 HUB - 4 Port USB-C Timing Control Hub. Provides power, communication, synchronization and control for up to four CrashCam mini cameras with USB-C connectors. 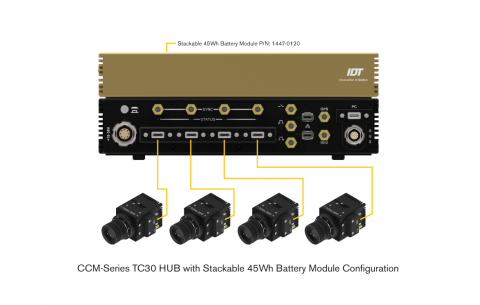 Dual battery connector ports compatible with Stackable 45Wh Battery Modules 1447-0120 allow for untethered operation. Recommended accessory sold separately: Intel® Core™ m5-6Y57 vPro™ processor. Stackable 45Wh Battery Module for TC HUB's. 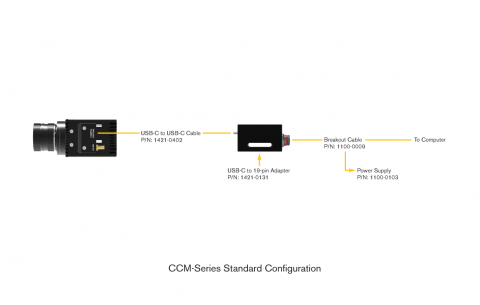 Provides approximately 30 minutes* of runtime for TC19 HUB 1447-0100 or TC30 HUB 1447-0110. Can use up to two on a TC19 HUB 1447-0100 or TC30 HUB 1447-0110. 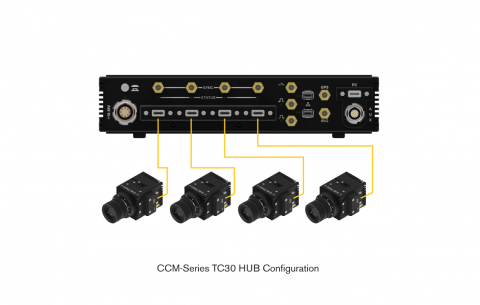 Includes two clamp locks and screws for attachment to TC19 HUB or TC30 HUB *Battery duration based on number of cameras and functions being used simultaneously. Warranty includes workmanship; Battery Cell not covered by warranty. SMA to BNC cable, SMA Male to BNC Male, 5.0 ft. Can be used with trigger pickle switch or between SMA connectors on hubs and devices with BNC connectors. 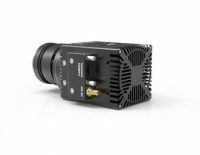 Compatible with all camera series and hubs.